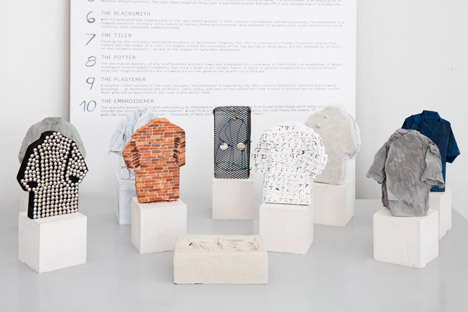 London Design Festival 2015: London-based Studio Toogood has created 150 oversized foam coats for V&A visitors to wear while following a trail around the museum. 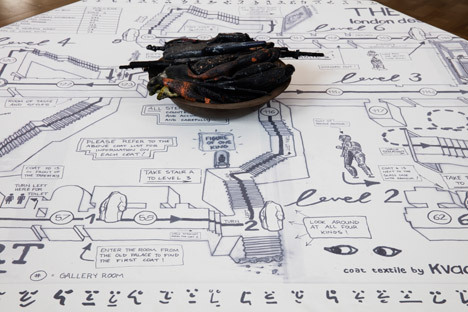 The Cloakroom project is a collaboration between Faye Toogood, known better for her furniture, and her sister Erica, who is a Savile Row-trained pattern cutter. The duo have been working together to design clothes for two years and are set to show their fourth collection in Paris next month. "This whole installation is about uniting my sculptural furniture background with Erica's pattern cutting and fashion background," said Faye, who previously designed gender-neutral retail spaces for Selfridges. 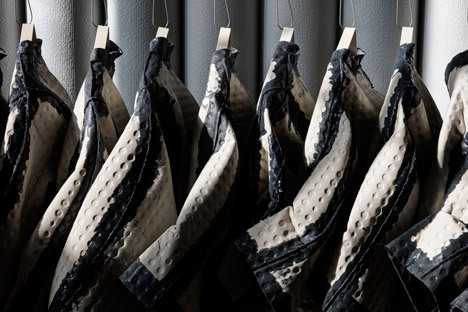 For the V&A, the sisters produced 150 coats to be borrowed and worn by visitors based on their Oil Rigger pattern from the Toogood – Unisex Outerwear range. They can be picked up from a space surrounded by floor-to-ceiling curtains in one corner of the museum, where the garments hang from a metal rail that curves around the room – furnished with pieces from Faye's Assemblage 4 collection. The coats are made from the Highfield compressed foam fabric produced by Danish textile company Kvadrat, which has previously collaborated on a range with fashion designer Raf Simons. "We chose this fabric because it's a very sculptural fabric and it takes on the pattern very well," said Faye. "Even on the hangers it has a 3D quality to it." The seams are hand-painted with a dark silicone to emphasise the pattern and cut. Each coat also has a different character face painted on the back "because we don't want to wear a uniform and all be the same," said Faye. Inside the coats is a giant label, which detaches from the back thanks to a popper. On one side of the label is a map that shows a route around the V&A, which was chosen by Faye to highlight her favourite spots around the building. 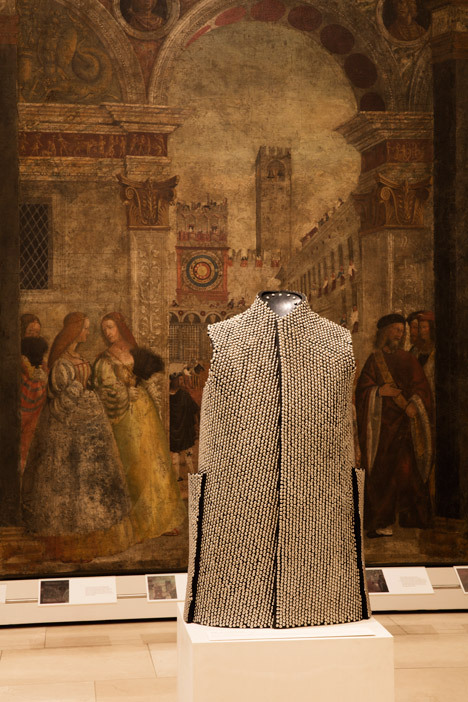 Along the route are 10 sculptures of the same coat, but crafted in materials that reflect their position in the museum. 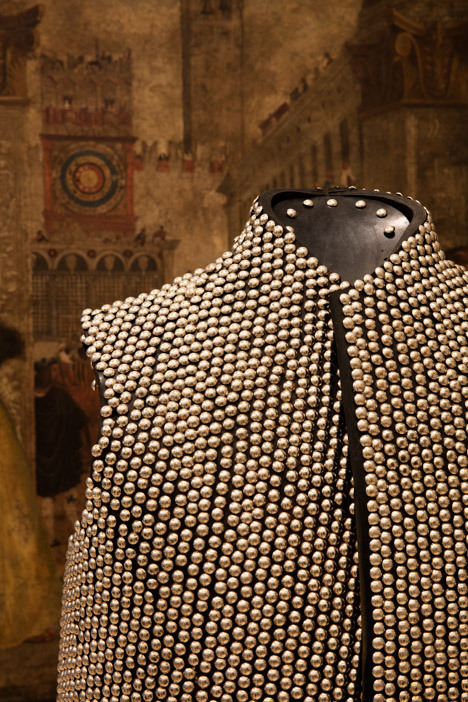 Marble, wood and metal rivets are among the selection used for the pieces, which are each based on a traditional craft. The marble reflects the building's lobby and the wood matches panelling in one of the 16th century Britain galleries. "We're very passionate about trade and manufacturing," said Faye, who previously suspended 49 coats above a street in Covent Garden for the Dezeen's Seven Designers for Seven Dials project. 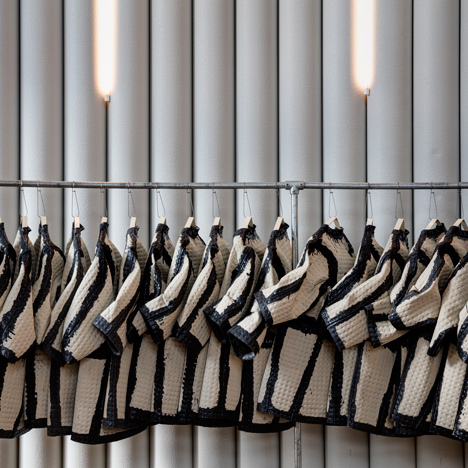 The Cloakroom was installed to coincide with this year's London Design Festival, which takes place from 19 to 27 September 2015. As a hub venue for the event, the V&A is also hosting also hosting a giant crystal zoetrope, a tower of tiny ceramic shops, and a series of mirrored platforms in different locations around the building. 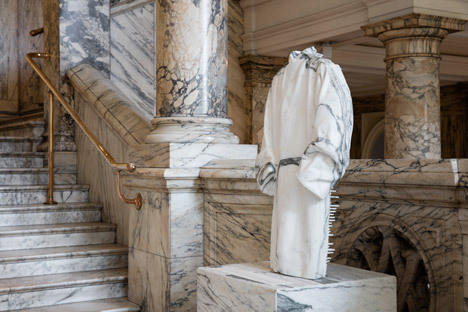 The post V&A visitors can borrow foam coats from The Cloakroom by Faye and Erica Toogood appeared first on Dezeen.